You may recognise this iconic French dish from our À La Carte menu. It has a long and interesting history in the culinary landscape which we thought we would share with you. Hearty and delectable, beef bourguignon is famous not only across France but all over the world. It is a dish as famous as other French classics such as ratatouille or coq au vin. It is a rich slow cooked beef stew, where the beef is braised in red wine with potatoes, carrots, mushrooms, garlic, onions and a bouquet garni (bundle of thyme, parsley and bay leaves). There are a few variations of the dish, notably the addition of lardons to some recipes, such as ours. 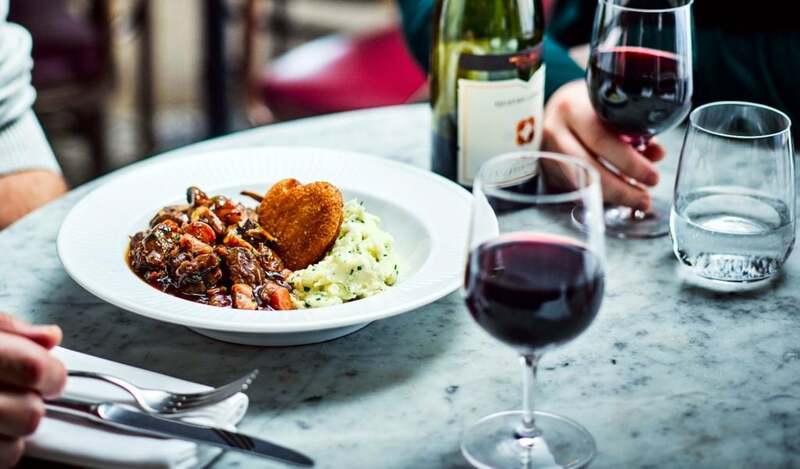 Beef bourguignon originates in provincial Burgundy, a region which is called Bourgogne in French - hence the name, where the prized Charolais cattle famously make excellent beef. 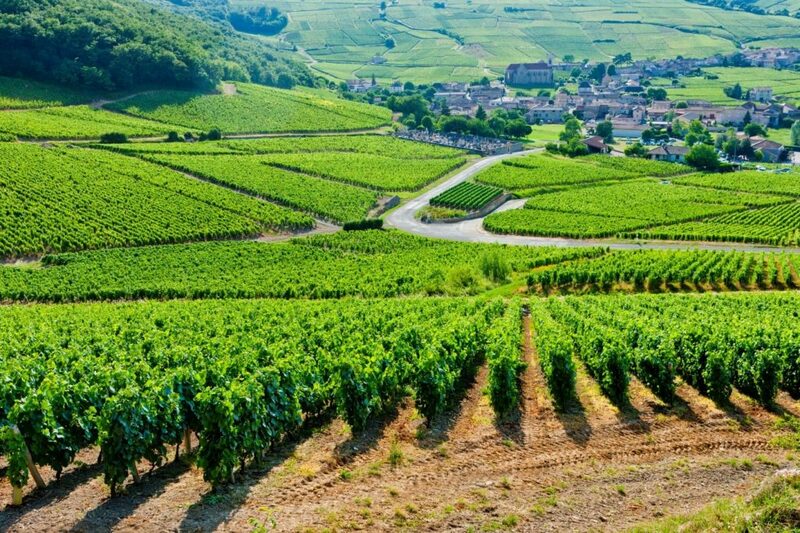 The Burgundy region is also well known for exceptionally good wine, so, naturally, the region’s signature and historical dish is a combination of these two specialities. The choice of wine that the beef is stewed in is extremely important. The red wine should be a Burgundy red; a Pinot Noir or Gamay ideally. The flavours of the wine infuse the beef and beautifully complement the other ingredients, making the stew rich and intensely flavoursome. Boeuf bourguignon dates back to the Middle Ages and began as peasant food. At the time, slow cooking was popular in rural areas because it was cheap, filling, and could feed many. It was also a safe and thorough way to cook tougher cuts of meat that would have otherwise gone to waste. Traditionally, this dish took two days to prepare; the longer it cooked, the more powerful the flavour and the more tender the meat would become. Over centuries, this dish has evolved from peasant fare to typical Parisian bistro dish, to what is now a byword for French cuisine. Tasty and versatile, the beauty of this dish is that it can happily be cooked and served in many contexts. Despite there being records of this dish existing all the way back to the Middle Ages, the first written recipe of it only appeared in 1903 by chef Auguste Escoffier, known as ‘the king of chefs’ or the ‘grandfather of classical French cuisine’. Auguste Escoffier brought this provincial dish to the dining tables of high society city folk. Those who dined out in style at the expensive and elegant haute cuisine restaurants of Paris and London, such as the Ritz, the Savoy, and the Carlton Hotel. His original method used a whole piece of beef, but the recipe has since evolved to using diced or cubed beef. This evolution was in part launched by famous American cookbook author, chef and TV star Julia Child, who wrote the epic 1961 cookbook: Mastering the Art of French Cooking. In this book, Julia included her take on the classic recipe, incorporating lardons, as well as instructions to dry off the beef with paper towels before searing it in the pan and a number of other particular techniques that made her recipe extremely popular. Julia Child thus delivered the delights of boeuf bourguignon to American kitchens. She described it in her book as "certainly one of the most delicious beef dishes concocted by man" and it became one of her better-known recipes, propelling it to international culinary stardom. Beef bourguignon continues to be a favourite amongst foodies all over the world. Many famous chefs have shared their customised beef bourguignon recipe, including Anthony Bourdain, Richard Olney and Michel Roux. From adding a pig’s trotter to the stew and using beef cheek or marinating the meat beforehand to caramelising the onions – all of these personal takes on the traditional concoction don’t harm the integrity of the dish, but merely enrich it or add a signature characteristic that is personal to the chef in question. It shows the versatility of a simple yet exquisite dish. Our chefs often describe their fondness for the beef bourguignon. It’s such a satisfying dish to prepare and to consume and it is one that carries a history as rich as its taste. This makes it a special dish in our eyes at Côte.